Philips Lumea Essential BRI861 review - should you buy it? The Philips Lumea Essential BRI861, the least expensive in the Philips Lumea range, is great value. It's compact and basic spec still benefits from the same thoughtful design and refined build quality you get with the premium models. It's easy to use, comfortable to hold and provides several years of body treatments. But I suggest it's best for treating underarms, bikini line, face and forearms because it's not the fastest on large areas like legs. Online reviewers love it, keep reading this full Lumea Essential BRI861 review to see if you will too. 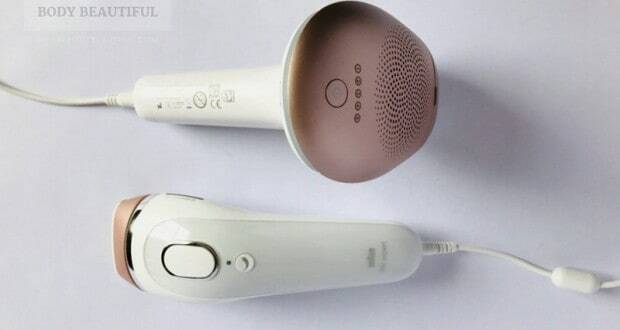 The Philips Lumea Essential BRI861 uses Intense Pulsed Light (IPL) to slow and eventually stop hair regrowth with continued use. It’s the smallest in the Philips Lumea range and it comes with the lowest price to reflect the basicdesign. It gets a high rating from me. This model was new in early 2016. 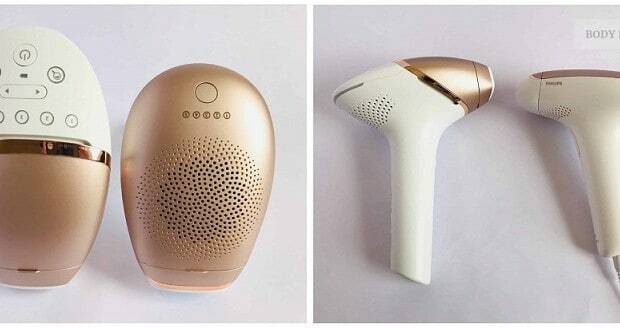 In the UK and Europe, it replaces the older Lumea Comfort. It has EU CE clearance for sale in Europe but it doesn’t yet have FDA clearance so it’s not available in the US. Check out the decent Lumea Comfort alternative if it’s not available where you live. 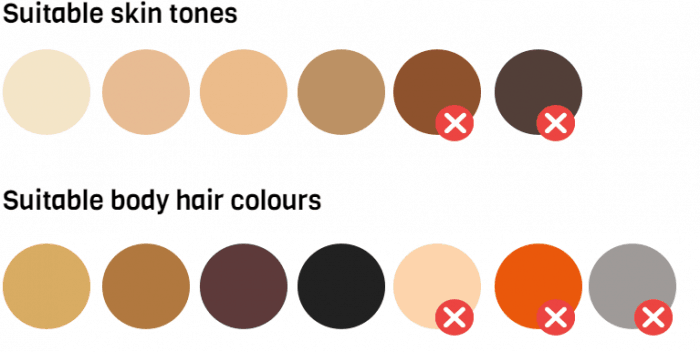 You can’t use it on light blonde, red, grey or white hair and dark brown, brownish black and darker skin tones (Fitzpatrick skin type V and VI), or on freckles and moles. You should begin to notice the hair reduction results after your 3rd fortnightly treatment. You’ll need about 4 to 5 treatments over a total of 8 weeks to see significant results. Less frequent maintenance treatments are required to keep your skin smooth. The Essential is similar to other basic home IPL devices. There’s a standard skin tone sensor, 5 energy levels and continuous and single flash modes. You’ll get loads of treatments from it, enough for 10 years of monthly use. 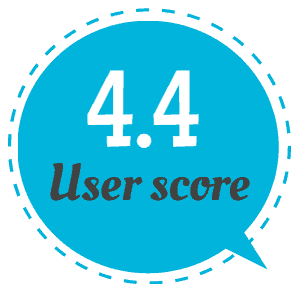 The online reviews are reassuringly positive too, they tell us it works and is easy to use. It’s a classy bit of kit, tactile, robust and ergonomic, better than most other no-frills brand models. The down side is the average application time – it’s fine for small areas but faster choices are available at a similar price for treating larger areas like legs. There’s more in the pros and cons sum up below. And keep reading the full Philips Lumea Essential BRI861 review for a more in-depth look at the online feedback and alternatives. Application is slow on large areas like legs. Faster alternatives are available. 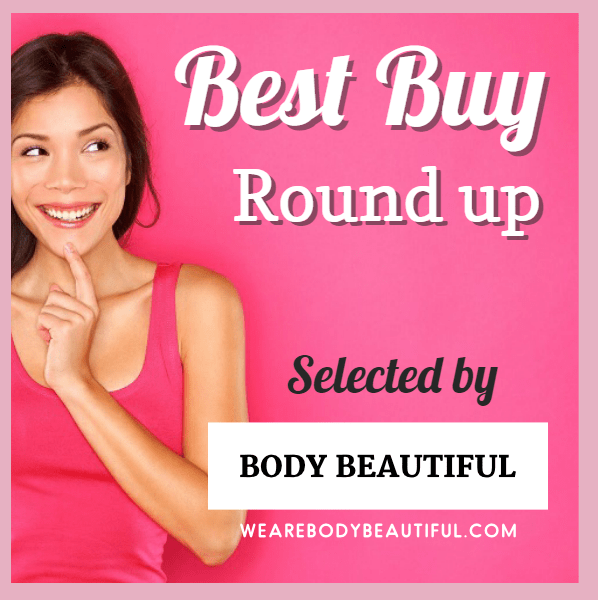 What’s the feedback from the online Lumea Essential BRI861 reviews? The Philips Lumea Essential BRI861 provides great value for money with plenty treatments. 200,000 flashes combined with the 3.2 cm2 body treatment window means you can treat a total body area of 640,000 cm2, or 160 full body applications for 10 years of use. Yes. The 200,000 flashes and 3.2 cm2 treatment window equals a body area coverage of 640,000 cm2 . By my calculations, that’s around 160 full body applications to last around 10 years of monthly use. That’s likely more than you’ll ever need. It’s average. It has a 3.2cm2 treatment window and it takes from 1.3 seconds and up to 2.9 seconds to recharge between flashes at the lowest and highest intensity levels respectively. Therefore, to treat a pair of armpits (120 cm2) it takes between 0:49 and 1:49 minutes. The Philips user manual states it takes 8 mins per lower leg. The speed is fine if you’re treating small areas like your face, underarms, bikini line and forearms but it’s slow for large areas like full legs and torso. A few reviewers say it takes a long time to treat their full legs – one notes the time is proportional to the size of your thighs! So bear this in mind. You could try splitting out treatments across multiple days, or just check out the alternatives section below for something faster. 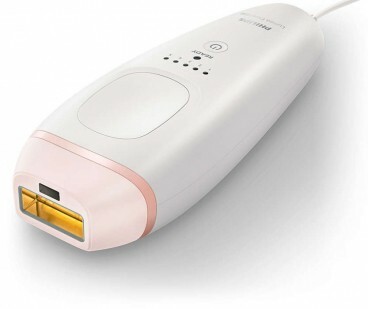 What do the online Philips Lumea Essential BRI861 reviews say? The overall score from the Philips Lumea Essential BRI861 reviews is a reassuring 4.4 out of 5 stars. Firstly, it’s not obvious but the reviews you’ll find on Amazon.co.uk mostly relate to the Philips Lumea advanced models. This is a bit misleading as it’s an entirely different device! I’ve excluded these reviews from the feedback summary. Boots.com has several helpful reviews and I’ve summed these up below. Let’s look at the low ratings and negative feedback first. There are less than handful of low and neutral ratings. It didn’t work for one reviewer who’d been using it as directed for 4 sessions. Another reviewer had no hair reduction results after about the same timeframe (7 weeks). Another found some hair reduction results after 7 weeks, but had hoped for more. They left a neutral 3 star review and noted they would keep using it as it was ’definitely worth a try’. Most reviewers left 4 or 5 star ratings. Reviewers tell us that it’s easy to use – lightweight, a long cord, easy to hold, clear instructions and simple buttons to operate it. Several love the low price compared to other choices and that it’s pain free compared to waxing. Some reviewers say how much they like the BRI861, and aside from it being ‘effective and the above comments, they don’t leave any further detail. But we do get good insight on the results experienced by other reviewers. Philips advise you to use the BRI861 every 2 weeks. After 2 or 3 treatments you’ll notice hair reduction results. After 4 or 5 treatments (6 to 8 weeks), your results will be significant. They then advise monthly maintenance treatments to keep you fuzz-free. Many reviews support this guideline. They report a slower re-growth rate, that’s softer, less coarse and lighter. They notice bald patches appear and they need to shave much less frequently. Some find this quickly after the first couple of treatments, and others need 4 or 5 treatments to see the same results. One reviewer reported a ‘drastic reduction on armpits and face’ after 1.5 months. Another had ‘perfect results in 3 months’. They also note, different body areas respond quicker, but there’s no consistent rule to it. There aren’t many reviews updated or shared after several months of use. However, as with the longer-term reviews from other Philips models, you’d expect the results to get better and the time between maintenance treatments to extend with prolonged use. Two alternative, no-frills devices at around the same price are worthy of your consideration. The Smoothskin Bare is sure to perk your interest. It’s the same price, has unlimited flashes and it’s superfast – the fastest out there. It’s suitable for darker skin tones too, although not for the darkest (Fitzpatrick type VI). If you live in the UK, Europe and Australia definitely check out this one – it scores big, even higher than more premium alternatives. It’s not available in the US, so keep reading for your alternative. The Silk’n Flash&Go Express (Silk’n Glide Xpress in the UK and Europe) is a strong alternative too. It’s around the same price, has so many flashes you’ll never use them all and it too is faster than the BRI861. Read the full review here. If you can stretch your budget: Bear in mind, you can spend less than £50 more and choose from premium devices with attractive features such as the Smoothskin Gold and Lumea Advanced. 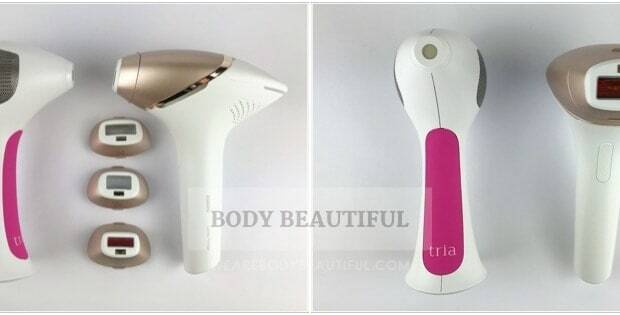 Should I buy the Philips Lumea BRI861? 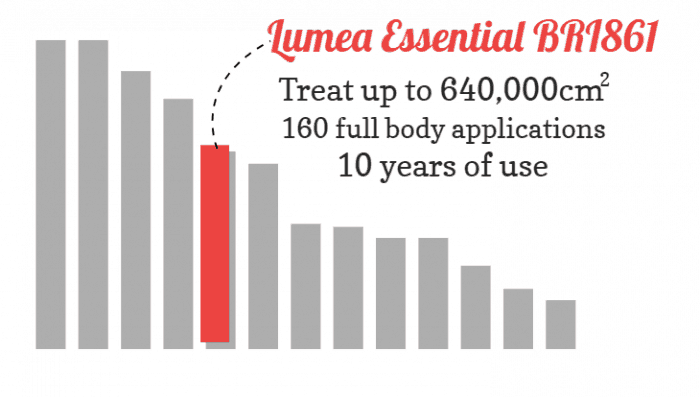 The Lumea Essential is a fine choice for all budgets. It’s a great quality design that’s best suited for small areas like underarms, bikini line, forearms and face. Larger areas i.e. legs, will take time and concentration to cover accurately, and that will put some off. If that’s you, faster alternatives are available (as above). You can check prices and buy the Lumea essential below. Philips Lumea 100 day money back guarantee.